The Great Book of BASE - Eyewear For BASE? 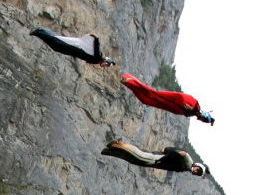 One reader wrote to me asking whether he should wear eye protection while BASE jumping, and if so, what kind? Fog up on the exit point, thus annoying you and stressing you out. Come halfway off of your face in freefall or during opening, thus obscuring your vision. Let wind onto your eyes, causing them to tear which leads to puddles on the inside of your lenses, thus blurring vision. Shatter into eyeball-slicing glass shards if you crash on your face. For most wingsuit jumps, I use a nice pair of ski goggles with a very light tint. While ski goggles do restrict peripheral and vertical vision more than typical skydive goggles, mine provide excellent wind protection and fit better than any type of "skydive-specific" eyewear that I have tried. Also, those cheap flexible skydive goggles tend to have a noticeable effect on depth perception, making the true distance to the ground harder to detect. For shorter slider up jumps and all slider down jumps, most experienced jumpers usually go without eyewear.